You'll be able to maintain progress in the psychedelic crime game between both systems. Hotline Miami was one of those pleasant surprises in the world of gaming: an offbeat title that came out of nowhere and had no great pretensions other than providing some not-entirely-rational fun. While the PC version of the game is hardly demanding from a hardware standpoint, those who prefer console and handheld gaming now have a way to experience the highs and lows of a retro Miami hitman. This Spring, gamers will be able to tackle a variety of mobsters for men in animal masks on both the PS3 and the Vita, with a Cross-Buy feature allowing players to carry their progress from one platform to another. The game will make its way to Sony's two platforms with gameplay, graphics, and music intact, but nothing new, save for the fact that buying it on one system will allow you to download it on the other. "The intense visuals and pulsing soundtrack are perfectly suited for PS3 and PS Vita and we can't wait for PlayStation fans to see what Hotline Miami is all about," says Shahid Ahmad, a senior business development manager at Sony. As always, Devolver Digital CFO Fork Parker has some commentary as well, expressing satisfaction that Sony gamers will get the chance to experience his company's trippy little title. "However, this Cross-Buy thing might prohibit me from achieving my long-standing dream of wearing a gold plated PS Vita around my neck. Total bummer." 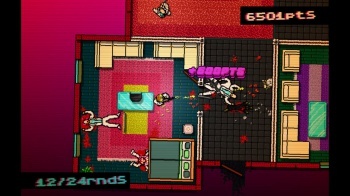 Hotline Miami's fast-paced gameplay and throwback graphics make it a logical choice for a handheld, although playing it on a console should faithfully recreate the PC experience as well. As long as it continues to embrace ultraviolence and blur the lines between psychedelic haze and gruesome reality, the ports should prove as entertaining as the original.